The Columbia River - "A Photographic Journey" - "Penny Postcards"
"The Golden Age of Postcards"
The early 1900s was the "Golden Age of Postcards", with the "Penny Postcard" being a popular way to send greetings to family and friends. Penny Postcards today show us a snapshot of history, as seen in these views along the Columbia River. The trail follows that of Lewis and Clark from the Tri-Cities of Pasco, Kennewick, and Richland, Sacajawea State Park at the mouth of the Snake River, down the Columbia to end at Cape Disappointment, Astoria, and Seaside and the Pacific Ocean. Click on each thumbnail to enlarge the card, or click on the "advance arrows" to learn more about the area and see what it looks like today. Please do not download these images without permission. Note -- this file is getting rather large (260K) and will someday soon be divided into smaller chunks. But until then, thank you for your patience while it loads. It loads pretty fast. Enjoy. Dating these postcards -- the generally accepted postcard guideline which I followed here is, "Pioneer Era" preceeded the "Private Mailing Card", popular between 1898 and 1901, "Undivided Back" cards were 1901 through 1907, "Divided Back" cards began in 1907 through 1915, "White Border" began in 1915 and continued to 1930, "Linen" cards were popular in the 1930s and continued through about 1945, and "Chrome" began in 1939 and continues today. "Real Photo" cards were first introduced around 1900. One cent postage was from 1872 to 1917 when it went to 2 cents. In 1917 postage went back to 1 cent and continued until 1952, when once again it went to 2 cents. If a copyrighted date was on the card, that was used. If a postmark was on the card that was considered. Click image to enlarge Lewis Street, looking west, Pasco, Washington, ca.1909. Penny Postcard, Copyrighted 1909, "Lewis St. Looking West, Pasco, Wash.". Image copyrighted 1909 by O.C. Towne's. Published by The Towne's Studio. In the private collection of Lyn Topinka. Click image to enlarge Docks, Pasco, Washington, ca.1910. Penny Postcard, ca.1910, "Pasco Docks, Pasco, Wash.". Divided back. In the private collection of Lyn Topinka. Click image to enlarge Columbia River Bridge between Pasco and Kennewick, Washington, ca.1930. Penny Postcard, Postmarked 1930, "Columbia River Bridge between Pasco and Kennewick, Wash." This bridge was constructed in 1922. It was replaced by a cable-suspension bridge in 1978. Published by J.L. Robbins Co., Spokane, Washington. Card #1855. Card is postmarked September 2, 1930. In the private collection of Lyn Topinka. Penny Postcard, ca.1940s, "Sacajawea State Park, State of Washington.". Washington's Sacajawea State Park is located at the confluence of the Snake River with the Columbia River. Lewis and Clark camped at this location in October 1805, their first nights on the Columbia. In the private collection of Lyn Topinka. Click image to enlarge Snake River Bridge at Lewiston, Idaho, ca.1905. Penny Postcard, ca.1905, "Snake River Bridge at Lewiston, Idaho.". Lewiston, Idaho, and Clarkston, Washington, located at the confluence of the Clearwater River with the Snake River, were both named after Lewis and Clark. Published by Edw. H. Mitchell, San Francisco, for Thatcher & Kling. Undivided back. In the private collection of Lyn Topinka. Penny Postcard, Postmarked 1908, "Fort Walla Walla, Walla Walla, Wash." Published by Sprouse & Sons, Tacoma, Washington. Made in Germany. Card is postmared July 16, 1908. In the private collection of Lyn Topinka. Click image to enlarge Mill Creek near Walla Walla, Washington, ca.1907. Penny Postcard, Postmarked 1907, "Mill Creek near Walla Walla, Wash." Published by M. Rieder, Los Angeles. Made in Germany. Card is postmarked November 28, 1907. Card #1645. In the private collection of Lyn Topinka. Click image to enlarge Mill Creek, Walla Walla, Washington, ca.1910. Penny Postcard, ca.1910, "Scene on Mill Creek, Walla Walla, Wash." The first Fort Walla Walla was built on the Columbia River. In 1856 a fort was built up the Walla Walla River on Mill Creek, near its junction with the Walla Walla River. By 1857 a village evolved around the fort. Published by M. Rieder, Los Angeles. Made in Germany. Card #1636. In the private collection of Lyn Topinka. Penny Postcard, ca.1920, "Hell's Smoke Stacks. One of the Wonders of Oregon's Scenery." Image copyright Weister Co. Published by Lipschuetz & Katz, Portland, Oregon. Card #392. This basalt outcropping is the "Twin Sisters", located in the state of Washington, on the south side of the Columbia River. In the private collection of Lyn Topinka. Penny Postcard, ca.1940s, "McKinzie and Ross Rocks, Wallula Cut Off". Ellis Photo, Card #2861. In the private collection of Lyn Topinka. Penny Postcard, Chrome, Postmarked 1956. Caption on the back reads: "Dinty's Cafe, Motel & Service Station on Highway 30 & 97, 18 miles east of The Dalles dam. One of the oldest landmarks on the Old Oregon Trail. Built in 1918. Dug out of the rocks of the cliff. Mr. & Mrs. P.L. Finley, owners, Rufus, Oregon." Natural Color R Card, from Kodachrome. A Mike Roberts Color Production, Berkeley 2, Calif. Distributed by Western Sales Co., 1034 La Point, Boise, Idaho. Postmarked September 25, 1956, from Rufus, Oregon. Card #SC2680. In the private collection of Lyn Topinka. Penny Postcard, ca.1940s - 1950s. Color Photo by George Lindsay. Published by Weisters Color Sales, Inc., Portland, Oregon. Card #K-1746. The Biggs-Maryhill Ferry was replaced in 1962 by the "Sam Hill Memorial Bridge", taking travellers between Biggs, Oregon, and Maryhill, Washington. In the private collection of Lyn Topinka. Penny Postcard, ca.1910, "Bridge over the Deschutes River, Oregon, On the Line of the O.W.R. & N. Co." Published by the Oregon Post Card Co., Portland, Oregon. Card #1387. In the private collection of Lyn Topinka. Penny Postcard, ca.1910, "Palisades of Deschutes River, Oregon. On the line of the O.W.R. & N. Co." Published by the Portland Post Card Co., Portland, Oregon. Card #1395. In the private collection of Lyn Topinka. Penny Postcard, Image 1900, Postmarked 1905, "Celilo Falls, Oregon.". The Oregon Historical Society has the original of this image (#OrHi89622), "Celilo Falls on the Columbia" by Benjamin Gifford, 1900. Card is postmarked August ___, 1905. Postmark "World's Fair, Portland, 1905". Card #67. In the private collection of Lyn Topinka. Penny Postcard, Postmarked 1917, "Celilo Falls near 'The Dalles', Columbia River, Oregon.". Caption on back reads: "This view shows the falls at low water. When the snow melts in summer in the mountains, the water often rises sixty feet; at that time steamers pass safely over.". Published by Chas. S. Lipschuetz Company, Portland, Oregon. Card #236. "On Union Pacific System". In the private collection of Lyn Topinka. Penny Postcard, ca.1930, "Fish Wheel and Indians Snagging Salmon at Celilo Falls on Columbia River, Oregon." Caption on bottom reads: "Indians have Perpetual Fishing Rights at the Falls.". Image Copyright Cross & Dimmitt. Published by Angelus Commercial Studio, Portland, Oregon. Card #13. In the private collection of Lyn Topinka. Penny Postcard, ca.1930, "Celilo Falls from Columbia River Highway, Oregon". Image Copyright Gifford, 7A-H74. Published by Wesley Andrews Co., Portland, Oregon. Card #858. In the private collection of Lyn Topinka. Penny Postcard, ca.1920, "Celilo Canal, near The Dalles, Oregon.". A.M. Prentiss Photo. Published by Lipschuetz & Katz, Portland, Oregon. Card #401. In the private collection of Lyn Topinka. Penny Postcard, ca.1920, "Upper Section, The Dalles-Celilo Locks, Oregon". On the right hand side by side is The State Portage Railway and the O.W.R.& N. Line. The North Bank Railroad Bridge in distance. Published by Chas. S. Lipschuetz Company, Portland, Oregon. Card #200. In the private collection of Lyn Topinka. Penny Postcard, ca.1920, "Celilo Falls, Upper End of Celilo Canal and Indian Village, B.C. Markham, The Dalles, Ore.". Card #95. In the private collection of Lyn Topinka. Penny Postcard, ca.1920. Card #650. In the private collection of Lyn Topinka. Penny Postcard, Postmarked 1946, "Cape Horn, Oregon Trail Highway, Oregon". This is not today's Cape Horn, but the "Cape Horn near Celilo" made famous by Carleton Watkins in 1867. Sawyer Scenic Photo, Card #C13121. In the private collection of Lyn Topinka. New "Penny Postcard", "Cape Horn Near Celilo, Columbia River, 1867.". Image created in 1867 by Carleton Watkins, Postcard from 1983. Oregon Historical Society Columbia River Gorge Postcard Series II (Watkins Series). Carleton E. Watkins No.456. Published by Western Imprints, the Press of the Oregon Historical Society. In the private collection of Lyn Topinka. Click image to enlarge Looking up the Columbia from The Dalles, Oregon, ca.1910. Penny Postcard, ca.1910, "Looking up the Columbia River, from the Dalles, Oregon.". Published by The Portland Post Card Company, Portland, Oregon. Made in Germany. Card #6033. In the private collection of Lyn Topinka. Penny Postcard, Dated 1909, "Seufert Brothers Col, Salmon Cannery, The Dalles, Oregon, The Dalles in the Distance.". Mount Hood, Oregon, is on the left. Published by The Portland Post Card Company, Portland, Oregon. Card #6027. Hand-written message on card is dated January 3, 1909. In the private collection of Lyn Topinka. Penny Postcard, ca.1910, "Seining Salmon, near The Dalles, Oregon.". Published by Benj. A. Gifford, The Dalles, Oregon. Made in Germany. Card #265. In the private collection of Lyn Topinka. Penny Postcard, ca.1910, "Seining Crew Hauling Seine Columbia River.". Published by Pacific Novelty Co., San Francisco. Made in Great Britain. Card #928. In the private collection of Lyn Topinka. Penny Postcard, ca.1920, "Old Fort Dalles, Oregon". Building on the right was the Guard House. Part of the "Ezra Meeker Historical Post Cards for School, Libraries, the Home, and Collections." In the private collection of Lyn Topinka. Penny Postcard, Postmarked 1910, "Old U.S. Army Post near The Dalles, Oregon.". Building is former "Officer's House", now an Oregon Museum. The "Officer's House" is the oldest history museaum in Oregon. The house was built in 1856. Published by Portland Post Card Co., Portland, Oregon, and Seattle, Washington. Made in Germany. Card #70543. In the private collection of Lyn Topinka. Penny Postcard, Dated 1909, "Ferry Across Columbia River at THE DALLES, Oregon". Card is dated 6/22/09. Divided back. Published by Sprouse & Son, Tacoma, Importers & Publishers, Washington. Made in Germany. In the private collection of Lyn Topinka. Penny Postcard, ca.1920, "Mount Hood as seen from bank of the Columbia River near The Dalles, Ore.". A.M. Prentiss Photo. Published by Lipschuetz & Katz, Portland, Oregon. Card #447. In the private collection of Lyn Topinka. Penny Postcard, ca.1920, "Mayer Park, Rowena Heights, On Columbia River Highway". Photo by A.M. Prentiss. Published by Rose City News Co., Portland, Oregon. Card #24. In the private collection of Lyn Topinka. Penny Postcard, Copyright 1908, Postmarked 1909, "Memaloose Island". Gifford Photograph. Published by Benj. A. Gifford, The Dalles, Oregon. Made in Germany. Card #208. In the private collection of Lyn Topinka. Penny Postcard, ca.1905, "Indian Buring Ground on a Columbia River Island, Oregon". Published by E.P. Charleton & Co., Portland, Oregon. Undivided back. In the private collection of Lyn Topinka. Penny Postcard, Image 1899, Postcard ca.1910, "Ferrying Sheep, Columbia River, Ore.". Caption for this image on the Oregon Historical Society Webpage is: "Sheep at the ferry, Klickitat Landing. Benjamin Gifford, 1899.". "Klickitat Landing" is today's Lyle, Washington. Published by the International Postcard Company, Portland, Oregon. Card #I-9. In the private collection of Lyn Topinka. Penny Postcard, ca.1910, "Klickitat River. Mt. Hood in the distance". Published by the Portland Post Card Co., Portland, Oregon. Card #6094. In the private collection of Lyn Topinka. Penny Postcard, Postmarked 1941, "Twin Tunnels on Columbia River Highway Between Hood River & Mosier, Ore.". Published by The Portland Post Card Co., Portland, Oregon. Published by Pacific Novelty Co., San Francisco. In the private collection of Lyn Topinka. Penny Postcard, Postmarked 1907, "Birds eye View of Hood River, Oregon.". Published by The Portland Post Card Co., Portland, Oregon. Made in Germany. Card is postmarked August 22, 1907. Card #106. In the private collection of Lyn Topinka. Penny Postcard, ca.1930, "Mt. Hood and Interstate Bridge to Columbia River Highway from Evergreen Highway.". Caption along bottom reads: "White Salmon, Wash. to Hood River, Oregon.". Card #826. View shows bridge before the lift span was added. In the private collection of Lyn Topinka. Penny Postcard, ca.1930, "New Bridge over Columbia River, near Hood River, Ore., Erected in 1926.". Published by The Oregon News Co., Portland, Oregon. Card #163. In the private collection of Lyn Topinka. Click image to enlarge Penny Postcard: Depot at Hood River, Oregon, ca.1900s. Penny Postcard, ca.1900s, "View of Hood River R.R. Depot, O.R. and N. Depot and Mt. Hood Hotel, Hood River, Oregon". Made in Germany, Sprouse & Son, Importers and Publishers, Tacoma, Washington, Card #129143. In the private collection of Lyn Topinka. Penny Postcard, ca.1905, "Mt. Hood, Oregon. Height 11225 Feet." Published by B.B. Rich, Official Stationer. Card is in the same style as offical cards from the 1905 Lewis and Clark Centennial (see below). In the private collection of Lyn Topinka. Penny Postcard, ca.1920, "Mitchell Point Tunnel, Columbia River Highway, Oregon". Published by Wesley Andrews, Inc., Portland, Oregon, Card #825. In the private collection of Lyn Topinka. Penny Postcard, ca.1920, "Mitchell's Point, Columbia River Highway, Oregon.". Published by Chas. S. Lipschuetz Company, Portland, Oregon. Card #327. In the private collection of Lyn Topinka. Penny Postcard, ca.1920, "Viaduct and Tunnel at Mitchell's Point from Columbia River Bank, Columbia River Highway, Oregon.". Published by The Oregon News Co., Portland, Oregon. Card #40. In the private collection of Lyn Topinka. Penny Postcard, ca.1920, "Windows in Storm Crest Tunnel, Columbia River Highway.". Handwritten note on back states that the steamer is the "Bailey Gatzert". Copyright Weister Co., Published by Chas. S. Lipschuetz Company, Portland, Oregon. Card #323. In the private collection of Lyn Topinka. Penny Postcard, ca.1920, "Mitchells Point Tunnel. Columbia River Highway, Oregon.". Sawyer Scenic Photo. Card #C-G50. In the private collection of Lyn Topinka. Penny Postcard, ca.1930, Postmarked 1951, "Mitchell's Point Tunnel. Columbia River Highway, Oregon.". Image Copyright Cross & Dimmitt. Published by Angelus Commercial Studio, Portland, Oregon. In the private collection of Lyn Topinka. Penny Postcard, ca.1920, "Interior Mitchell Point Tunnel, Columbia River Highway, Oregon.". Published by The Oregon News Co., Portland, Oregon. Card #59. In the private collection of Lyn Topinka. Penny Postcard, Postmarked 1921, "West Entrance to Mitchell's Point Tunnel, Columbia River Highway, Oregon.". Published by The Oregon News Company. Card #O-46. Card is postmarked May 26, 1921. In the private collection of Lyn Topinka. Penny Postcard, Postmarked 1937, "At the foot of Shell Rock Mountain, Columbia River Highway, Oregon.". Dog Mountain, Washington, is in the background. Published by The Oregon News, Portland, Oregon. Card is postmarked August 1937. Card #54. In the private collection of Lyn Topinka. Click image to enlarge Penny Postcard: "At Shell Mountain, Columbia River Highway", postmarked 1945. Penny Postcard, postmarked September 1945, "At Shell Mountain, Columbia River Highway, Portland, Ore." B.C. Markham. Card No.26. In the private collection of Lyn Topinka. Click image to enlarge Penny Postcard: Shellrock Mountain (left) and Wind Mountain (right), and the Columbia River, ca.1920. Penny Postcard, ca.1920, Columbia River, Shellrock Mountain, Oregon (left), and Wind Mountain, Washington (right). Caption reads: "Columbia River and Wind Mountain, Washington, from Columbia River Highway, Oregon". Copyright A.M. Prentiss. In the private collection of Lyn Topinka. Penny Postcard, 1908, "Wind Mountain, Columbia River". Published by Benj. A. Gifford, The Dalles, Oregon, Copyright 1908. Card #325. Made in Germany. In the private collection of Lyn Topinka. Penny Postcard, ca.1910, "Wind Mountain, Columbia River." Published by the Columbia Card Co., Portland, Oregon. Made in Germany. In the private collection of Lyn Topinka. Penny Postcard, ca.1920s, "Wind Mountain and Submerged Forest, Columbia River". Published by Chas. S. Lipschuetz Company, Portland, Oregon. Card #321. Lewis in Clark in 1805 commented on the "Submerged Forest" in the area of Wind Mountain. With the completion of the Bonneville Dam in 1938, the "Submerged Forest" is now truly submerged, drowned by the waters of the Bonneville pool. In the private collection of Lyn Topinka. Penny Postcard, ca.1920, "Columbia River and Wind Mountain, Washington, from Columbia River Highway, Oregon." Shellrock Mountain, Oregon can be seen on the left, and Wind Mountain, Washington is on the right. Image Copyright A.M. Prentiss. In the private collection of Lyn Topinka. Penny Postcard, ca.1930, "Upper Rock Creek Falls, Evergreen Highway Along Columbia River, Washington." The Photo by Wesley Andrews. Published by Wesley Andrews Co., Portland, Oregon. Card #553. In the private collection of Lyn Topinka. Penny Postcard, Postmarked 1909, "Steamer entering Cascade Locks, Columbia River". "The PCK Series", made in Germany. Card #10246. Card postmarked July 1909. In the private collection of Lyn Topinka. Penny Postcard, ca.1910, "Steamer Bailey Gatzert entering the Locks of the Cascades". Back: "On the Road of a Thousand Wonders". Published by M. Rieder, Los Angeles, Card #3941. Made in Germany. In the private collection of Lyn Topinka. Penny Postcard, Postmarked 1911, "Cascade Locks, Columbia River.". Litho Britton & Rey, San Francisco, California. Card #7015. Card is postmarked 1911. In the private collection of Lyn Topinka. Penny Postcard, ca.1910, "Cascade Locks, Columbia River, Ore.". Caption on back reads: "On the Road of a Thousand Wonders". Published by M. Rieder, Los Angeles, California, Card #4027. In the private collection of Lyn Topinka. Penny Postcard, ca.1920, "Cascade Locks, Columbia River, Oregon". Published by Lipschuetz & Katz, Portland, Oregon. Card#329. In the private collection of Lyn Topinka. Penny Postcard, ca.1910, "Columbia River Steamers in Cascade Locks". Card #90. In the private collection of Lyn Topinka. Penny Postcard, ca.1940, "The Oregon Pony". Caption on the back reads: "The Oregon Pony. The first steam engine to run on the Oregon Portage Railroad. Operated in 1862 and 1863, in freight and passenger service, on the southern bank of the Columbia River, between Bonneville and Cascade Locks. Now, stands in front of railroad depot, in Portland." Published by Anderson Sundry Co., Portland, Oregon. In the private collection of Lyn Topinka. Penny Postcard, ca.1940, "Exhibit Union Station, Portland, Oregon.". Photo by Eddy. Bronze plaque reads: "The Oregon Pony. First Locomotive in the Pacific Northwest. This engline was operated in 1862 and 1863 in freight and passenger service on the first Oregon railroad, on the southern bank of the Columbia River between Bonneville and Cascade Locks." In the private collection of Lyn Topinka. Penny Postcard, Postmarked 1910, "Bridge of the Gods, Columbia River.". View from the Oregon side of the Columbia River. Greenleaf Peak is in the background. Published by Portland Post Card Co., Portland, Oregon. Printed in Germany. Card #7055. In the private collection of Lyn Topinka. Penny Postcard, ca.1910, "Bridge of the Gods and Cascades of the Columbia River. On Line of O. W. R. & N. Co.". View from the Oregon side of the Columbia River. Image shows Table Mountain (left) and Greenleaf Peak (right) in the background. Image copyright Weister. Published by Edward Mitchell, San Francisco, California. Card #3182. In the private collection of Lyn Topinka. Click image to enlarge Bridge of the Gods, ca.1930. Penny Postcard, ca.1930, "Bridge of the Gods. Columbia River Highway. Cascade Locks, Ore.". Published by Beals Litho, Des Moines, Iowa. In the private collection of Lyn Topinka. Penny Postcard, ca.1920, "Approach to Eagle Creek, Columbia River Highway, Oregon.". Published by Lipschuetz & Katz, Portland, Oregon. Card #388. In the private collection of Lyn Topinka. Closein of "detail" of card above. Penny Postcard, ca.1920, "Approach to Eagle Creek, Columbia River Highway, Oregon.". Published by Lipschuetz & Katz, Portland, Oregon. Card #388. In the private collection of Lyn Topinka. Penny Postcard, ca.1920, "Eagle Creek Bridge, Columbia River Highway, Oregon.". Published by Wesley Andrews, Inc., Portland, Oregon. Card #813. In the private collection of Lyn Topinka. Penny Postcard, Postmarked 1923, "Eagle Creek and Highway Bridge, Columbia River Highway, Oregon.". Published by Chas. L. Lipschuetz Company., Portland, Oregon. Card #338. In the private collection of Lyn Topinka. Penny Postcard, ca.1920, "Eagle Creek Camping Grounds on the Columbia River Highway, Ore.". Eagle Creek Camping Grounds are the first U.S. Forest Service Camp Ground in the Columbia River Gorge. Published by The Oregon News Co., Portland, Oregon. Card #21. In the private collection of Lyn Topinka. Penny Postcard, ca.1920, "Hitting the Trail up Eagle Creek Canyon, from Columbia River Highway, Ore.". Published by The Oregon News Co., Portland, Oregon. Card #8225. In the private collection of Lyn Topinka. Penny Postcard, ca.1920, "Columbia River Highway, looking west from Eagle Creek.". Part of the caption on back reads: "This is another magnificent view from the highway, looking west from Eagle Creek at Tooth Mountain and showing Bridge of the Gods in the distance ...". Image copyright Weister Co. Published by Lipschuetz & Katz, Portland, Oregon. In the private collection of Lyn Topinka. Click image to enlarge Toothrock Tunnel and Bonneville Dam, view from the east, ca.1940s. Penny Postcard, ca.1940s, "Highway and Railway Tunnels, Bonneville Dam, Columbia River, Oregon". Published by Wesley Andrews Co., Portland, Or., Card #808. In the private collection of Lyn Topinka. Click image to enlarge Illuminated Toothrock Tunnel, ca.1940s. Penny Postcard, ca.1940s, "Illuminated Tunnel, near Bonneville Dam, Columbia River Highway, Oregon.". Photo by Wesley Andrews. Published by Wesley Andrews Co., Portland, Or., Card #778. In the private collection of Lyn Topinka. Click image to enlarge Bonneville Dam, view looking northeast, ca.1940s. Penny Postcard, ca.1940s". Published by E.C. Kropp Co., Milwaukee, Wisconsin. In the private collection of Lyn Topinka. Click image to enlarge Bonneville Dam, looking upstream, ca.1940s. Penny Postcard, ca.1940s, "Bonneville Dam, Looking Upstream, Columbia River Between Washington and Oregon.". Photo by Frank L. Jones. Published by Wesley Andrews Co., Portland, Oregon. In the private collection of Lyn Topinka. Click image to enlarge Bonneville Dam, Powerhouse and Canal, ca.1940s. Penny Postcard, Postmarked 1942, "Power Plant, Bonneville Dam, Columbia River between Washington and Oregon.". Photo by Frank L. Jones. Published by Wesley Andrews Co., Portland, Oregon. Card is postmarked April 27, 1942. In the private collection of Lyn Topinka. Click image to enlarge Bonneville Dam north side fish ladders, ca.1940s. Click image to enlarge Bonneville Dam Fish Counting Station, 1940s. Click image to enlarge North Bonneville, Washington, ca.1951. Penny Postcard, Postmarked 1951, "North Bonneville, Wash.". Christian, W-1184. Divided back. Postmarked date August 17, 1951, from North Bonneville, Wash. In the private collection of Lyn Topinka. Click image to enlarge Columbia River Highway, Tanner Creek Span and the Bonneville Spur, ca.1938. Penny Postcard, Postmarked 1938, "Tanner Creek Span and Bonneville Spur, Columbia River Highway, Oregon.". Published by Wesley Andrews, Co., Portland, Oregon. Card #853. Card is postmarked July 31, 1938. In the private collection of Lyn Topinka. Penny Postcard, ca.1910, "Famous Block House, on the Columbia River.". Caption on front reads: "Famous Block House on the Columbia River." No other indication of which Block House or where it might be located on card. An article in the Spokesman Review (November 29, 1814) showed this blockhouse image and called it "Fort Lugenbeel, facing north". In the private collection of Lyn Topinka. Photo Postcard, ca.1920, "Fort Rains Block House Memorial, Evergreen Highway, Wash.". Wesley Andrews Card #48. In the private collection of Lyn Topinka. Click image to enlarge Fish Wheel on the Columbia River, ca.1908. Penny Postcard, Postmarked 1908., "The Fish Wheel, Columbia River.". Published by Britton & Rey, San Francisco, California. Card #7002. Card is postmarked April 27, 1908. In the private collection of Lyn Topinka. Information from the Columbia Gorge Discovery Center Archives lists this image as "Bradford Island, Oregon shore, Scow wheel with leads". From: "Fishwheels on the Columbia" (Donaldson and Cramer, 1971): "Warren's No.2 scow. Eric Enquist tended this wheel, 1902-03. One year it captured 80 tons of salmon and blueback." Click image to enlarge Fish Wheel on the Columbia River, ca.1910. Penny Postcard, ca.1910, "Fish Wheel, Columbia River, Oregon." Oregon Series No.505. Printed in Germany. In the private collection of Lyn Topinka. From: "Fishwheels on the Columbia" (Donaldson and Cramer, 1971): "Looking downstream into dipway of what is believed to be one of the flimsy fishwheels near Mt. Pleasant and Lawton Creek on the Washington shore." Click image to enlarge Fish Wheel on the North Bank Road, ca.1910. Penny Postcard, ca.1910, "Cascade Mountains, Columbia River and Fish Wheel, On the North Bank Road." Published by the Portland Postcard Co., Portland, Oregon. Card #P1420. In the private collection of Lyn Topinka. Information from the Columbia Gorge Discovery Center Archives states this fish wheel is "Warren's scow 3, pre-1935, above North Bonneville, Washington shore". Penny Postcard, ca.1920, "Fish Wheel, Seen from the Columbia River Highway.". Published by Lipscheutz & Katz, Portland, Oregon. Card #386. In the private collection of Lyn Topinka. From: "Fishwheels on the Columbia" (Donaldson and Cramer, 1971): "Rebuilt Iron or Moffett Creek Wheel is in foreground, with Sams' No.2 across channel on Ives Island bar. Castle Rock Wheel shows on Washington shore nearer Beacon Rock. Another wheel lead can be seen faintly on the south side of Ives Island." Penny Postcard, ca.1920, "Fish Wheel, Columbia River, Oregon.". Published by Chas. S. Lipscheutz Company, Porland, Oregon. Card #250. In the private collection of Lyn Topinka. Click image to enlarge Moffett Creek Bridge, Columbia River Highway, Oregon, ca.1920. Penny Postcard, ca.1920, "Moffats Creek Bridge, Columbia River Highway.". Published by Pacific Novelty Co., San Francisco, California. Card #O-106. In the private collection of Lyn Topinka. Penny Postcard, ca.1920, "Moffett Creek Bridge. Columbia River Highway, Oregon.". Image copyright Weister Co. Published by Van Nuy Interstate Company. In the private collection of Lyn Topinka. Penny Postcard, Postmarked 1908, "Castle Rock on Columbia River". Published by Sprouse & Son, Importers and Publishers, Tacoma, Washington. Postcard has postmark of 1908. In the private collection of Lyn Topinka. Penny Postcard, Postmarked 1908, "Castle Rock on Columbia River, Winter Scene". Published by M.R.L.A. Made in Germany. Card #2968. Card is postmarked August 29, 1908. In the private collection of Lyn Topinka. Penny Postcard, ca.1910, "Castle Rock, Columbia River, Oregon." Published by Detroit Publishing Company. Card #5556. In the private collection of Lyn Topinka. Penny Postcard, ca.1910, "Castle Rock, Columbia River." Printed in Germany. Card #5552. In the private collection of Lyn Topinka. From: "Fishwheels on the Columbia" (Donaldson and Cramer, 1971): "Icehouse stationary fishwheel and remnant of Erickson Wheel on near shore, middle distance." Penny Postcard, ca.1910, "Castle Rock on the Columbia River, On the North Bank Road." Published by Portland Postcard Co., Portland, Oregon. In the private collection of Lyn Topinka. Penny Postcard, ca.1917, "Castle Rock, Table Mountain in the Distance, Columbia River. Seen from the Highway." This is in error as it is Hamilton Mountain in the background. Card is postmarked 1917. Published by Chas. S. Lipschuetz Company, Portland, Oregon. In the private collection of Lyn Topinka. Penny Postcard, ca.1920, "Horsetail Falls, Columbia River Highway, Oregon". Published by The Oregon News Company. Card #O-6. In the private collection of Lyn Topinka. Penny Postcard, Postmarked 1920, "Horsetail Falls, Columbia River Highway, Oregon". Caption on back reads: "Horsetail Falls. A fine view of this beautiful water fall is obtained from the Columbia River Highway. The Horsetail Falls are 208 feet high. This picture shows the Cathedral Domes beyond.". Published by Lipschuetz & Katz Company, Portland, Oregon. Card is postmarked 1920. In the private collection of Lyn Topinka. Penny Postcard, ca.1930, "Horsetail Falls. 205 feet. Columbia River Highway, Oregon.". Image copyright Cross & Dimmitt. Published by Angelus Commercial Studio, Portland, Oregon. Card #18. In the private collection of Lyn Topinka. Penny Postcard, Postmarked 1911, "Oneonta Bluff on the Columbia River.". Published by Spokane Post Card Co., Spokane, Washington. Made in Germany. Card #5177. Card is postmarked June 9, 1911. In the private collection of Lyn Topinka. Penny Postcard, ca.1920, "Rock Tunnel, Oneonta Gorge, Columbia Highway.". Published by Lelund Lund, Tacoma, Washington. Card #151. In the private collection of Lyn Topinka. Penny Postcard, ca.1920, "Oneonta Gorge Columbia River.". Published by The Oregon News Co., Portland, Oregon. In the private collection of Lyn Topinka. Penny Postcard, Image ca.1890s, Postcard ca.1910, "Multnomah Falls on O.R. & N. Railroad, Oregon.". A "timbered" bridge existed at Multnomah Falls in the 1890s. Published by Sprouse & Son, Tacoma, Washington. Made in Germany. Divided back. In the private collection of Lyn Topinka. Penny Postcard, ca.1901-1907, "Multnomah Falls, Oregon.". Published by Olds, Wortman and King, Portland, Oregon. Undivided back. In the private collection of Lyn Topinka. Penny Postcard, ca.1905, "Multnomah Falls". Published by B.B. Rich, Official Stationer. Card is in the same style as offical cards from the 1905 Lewis and Clark Centennial (see below). In the private collection of Lyn Topinka. Penny Postcard, ca.1920s, "Beautiful Multnomah Falls, Columbia River Highway, Ore.". Caption on back reads: "The Falls are about 780 feet high, and during the Spring and early Summer carry a very large vulume of water. Many tourists and picnickers stop at this point for lunch. Located 36 miles from Portland." Published by The Oregon News Co., Portland, Oregon. In the private collection of Lyn Topinka. Penny Postcard, ca.1930, "Multnomah Falls, Benson Foot Bridge, Columbia River Highway, Oregon." Caption on back reads: "Multnomah Falls in the Columbia River Highway, the second falls in size in the United States, drop in a veil of foamy white 620 feet down the rock walls of the Gorge. A foot trail leads from the highway across Benson Bridge, past the Falls, and on up to Larch mountain, an extinct volcano." Image Copyright Angelus. Published by E.C. Kropp Co., Milwaukee, Wisconsin. In the private collection of Lyn Topinka. Penny Postcard, ca.1920, "Multnomah Falls in Winter, Columbia River Highway." Published by Van Nuy Interstate Company. In the private collection of Lyn Topinka. Penny Postcard, ca.1920, "View in front of Multnomah Falls, Columbia River Highway, Oregon.". Building on left was the "Multnomah Hazelwood", an ice-cream stop which was open 365 days of the year. The Multnomah Hazelwood was built in 1916 and torn down in 1919. For a time, the Union Depot was connected to the Ice Cream shop. Published by The Oregon News Company, Portland, Oregon. Card #27. In the private collection of Lyn Topinka. Penny Postcard, ca.1920s, "Multnomah Falls Lodge, Columbia River Highway, Ore." The striped patio canopy was converted to a permanent part of the Lodge in 1929. Published by The Oregon News Co., Portland, Oregon. Card #170. In the private collection of Lyn Topinka. Penny Postcard, ca.1930s, "Multnomah Lodge, Multnomah Falls, Columbia River Highway, Oregon." Published by the Wesley Andrews Company, Portland, Oregon. Card #832. In the private collection of Lyn Topinka. Penny Postcard, ca.1920, "Viaduct near Multnomah Falls, Columbia River Highway, Oregon.". Published by The Oregon News Co., Portland, Oregon. Card #8320. In the private collection of Lyn Topinka. Penny Postcard, ca.1920, "Columbia River Highway Showing Castle Rock in the Distance.". Published by Chas. S. Lipscheutz Company, Portland, Oregon. Card #315. In the private collection of Lyn Topinka. Click image to enlarge Wahkeena Falls, Columbia River Highway, Oregon, ca.1920. Penny Postcard, ca.1920, "Wah-Kee-Na Falls, Columbia River Highway, Oregon.". Published by Wesley Andrews Co., Portland, Oregon. Card #839. In the private collection of Lyn Topinka. Click image to enlarge Penny Postcard: "Columbia River Highway Bridge at Gordon Falls", postmarked 1917. Penny Postcard postmarked August 1917. Published by Louis Scheiner, Portland, Oregon. Card #4577. In the private collection of Lyn Topinka. Penny Postcard, ca.1920, "Wah-Kee-Na Falls, Columbia River Highway, Oregon.". Published by Chas. S. Lipschuetz Company, Portland, Oregon. Card #307. In the private collection of Lyn Topinka. Click image to enlarge Benson Park Entrance, ca.1910. Penny Postcard, ca.1910, "At Benson Park Entrance, Columbia River Highway, Oregon.". Published by The Oregon News Company, Portland, Oregon. Card #O-73. In the private collection of Lyn Topinka. Penny Postcard, ca.1920, "Columbia River Showing Lone Rock Near Cape Horn, Oregon". View includes Cape Horn Landing on the left. Published by Pacific Novelty Co., San Francisco and Los Angeles. In the private collection of Lyn Topinka. Penny Postcard, ca.1910, "Sentinel Rock, Columbia River.". Published by M. Rieder, Los Angeles. Postmarked August 1913. Card #4046. In the private collection of Lyn Topinka. Penny Postcard, ca.1910, "Bridal Veil Falls on the Columbia River, Oregon." Published by M Reider, Los Angeles, California. Card #4013. Made in Germany. In the private collection of Lyn Topinka. Penny Postcard, ca.1910, "Bridal Veil Falls, Columbia River. On Line O. W. R. & N. Co." Published by Edward H. Mitchell, San Francisco. Card #2416. In the private collection of Lyn Topinka. Penny Postcard, ca.1930, "Bridal Veil Falls. Columbia River Highway, Oregon. 180 feet. Masterpiece of Scenic Beauty.". Published by Angelus Commercial Studio, Portland, Oregon. Card #9087. In the private collection of Lyn Topinka. Penny Postcard, ca.1910, "Logging Camp, Bridal Veil Falls, Oregon." Published for the J.K. Gill Co., Portland, Ore., by M.R., L.A. Card #3985. Made in Germany. In the private collection of Lyn Topinka. Penny Postcard, Copyright 1901, "Cape Horn on the Columbia River". Copyright 1901 by the Detroit Photographic Company. Undivided back. Card #5869. Cape Horn Landing is visible on the right. In the private collection of Lyn Topinka. Click image to enlarge Cape Horn, Washington, from upstream, ca.1905. Penny Postcard, ca.1905, "Cape Horn, 400 feet, Columbia River.". Published by D.M. Averill & Co. Publishers, Portland, Oregon. Undivided back. In the private collection of Lyn Topinka. Click image to enlarge "The Needles", Cape Horn on the Columbia River, ca.1911. Penny Postcard, Postmarked 1911, "The Needles, Cape Horn on the Columbia River.". Published by the Portland Post Card Company, Portland, Oregon. Card is postmarked October 6, 1911. In the private collection of Lyn Topinka. Penny Postcard, 1909, "Cape Horn Tunnel on the North Bank Road". View is of the western portal of Tunnel #1. Copyright 1909 by the Kiser Photo Company for the Spokane, Portland, and Seattle Ry. In the private collection of Lyn Topinka. Penny Postcard, ca.1920, "Cape Horn, Columbia River, Oregon". View is of the western portal of Tunnel #1. Published by Pacific Novelty Company, San Francisco and Los Angeles. In the private collection of Lyn Topinka. Penny Postcard, ca.1920, "Palisades on the Columbia River". Published by the J.K. Gill Co., Card #3952. Made in Germany. In the private collection of Lyn Topinka. Penny Postcard, ca.1920, "Passing Cape Horn, Columbia River". Caption along the bottom reads "'Dallas City', one of the many steamers out of Portland". Published by Chas. S. Lipschuetz Company, Portland, Oregon. Card has postmark of August 1921. Card #248. In the private collection of Lyn Topinka. Penny Postcard, Postmarked 1947, "Rock Shed at Cape Horn, Evergreen Highway". Christian W-755. Postmark April 23, 1947. In the private collection of Lyn Topinka. Penny Postcard, Postmarked 1908, "Pillars of Hercules, on Columbia River, Oregon.". View is looking east. The bluffs of Bridal Veil can be seen in the background. Card is postmarked June 17, 1908. Card #U.S.530. In the private collection of Lyn Topinka. Penny Postcard, ca.1910, "Pillars of Hercules on O. R. & N. Railroad.". Published by Sprouse & Sons, Tacoma, Washington. Printed in Germany. In the private collection of Lyn Topinka. Penny Postcard, ca.1910, "Pillars of Hercules, Banks of the Columbia River". The bluffs of the Bridal Veil area can be seen in the background. Published by Portland Post Card Col., Portland, Oregon (Made in Germany). Card #7054. In the private collection of Lyn Topinka. Penny Postcard, ca.1910, "Pillars of Hercules, Columbia River, Oregon." Card #7225. In the private collection of Lyn Topinka. Penny Postcard, ca.1910, "On the Columbia River". View shows train tracks through the Pillars of Hercules. San Francisco and Portland S.S. Co., Columbia River Route. In the private collection of Lyn Topinka. Penny Postcard, ca.1910, "Pillars of Hercules, Columbia River." Published by Louis Scheiner, Portland, Oregon. In the private collection of Lyn Topinka. Penny Postcard, Postmarked 1919, "Pillars of Herculkes, Columbia River Highway, Oregon.". View shows tracks after their move to the north side of the Pillars. Published by Chas. S. Lipscheutz Company, Portland, Oregon. Card #330. Card is postmarked August 18, 1919. In the private collection of Lyn Topinka. Penny Postcard, ca.1920, "Scene at Shepperd's Dell, Columbia River Highway, Ore.". Sand Island and the Columbia River are in the background. Published by The Oregon News Co., Portland, Oregon. In the private collection of Lyn Topinka. Penny Postcard, ca.1930, "Bishop Cap at Shepperd's Dell, Columbia River Highway, Oregon". Copyright Cross & Dimmitt. Angelus Commercial Studio, Portland, Oregon. In the private collection of Lyn Topinka. Penny Postcard, ca.1920, "Columbia River Highway, Oregon". Caption along top reads: "At Shepherd's Dell, the cliff had to be cut away to make room for autos to pass.". Published by Chas. S. Lipschuetz Company, Portland, Oregon. Card #262. In the private collection of Lyn Topinka. Penny Postcard, ca.1920, "Shepperd's Dell, Columbia River Highway, Oregon". Published by Chas. S. Lipschuetz Co., Portland, Oregon, Card #305. Image copyright Weister Co. In the private collection of Lyn Topinka. Penny Postcard, ca.1920, "Shepperd's Dell Bridge, Columbia River Highway, Oregon." Caption on back reads: "Shepperd's Dell Bridge. The Shepperd's Dell Bridge is 160 feet aove the stream, which is spanned with a reinforced concrete arch 100 feet long, the total length being 150 feet." Image copyright Weister Co. Published by Chas. S. Lipschuetz Company, Portland, Oregon. Card #326. In the private collection of Lyn Topinka. Penny Postcard, ca.1930, "Shepperd's Dell, Columbia River Highway, Oregon". Published by Angelus Commercial Studio, Portland, Oregon. In the private collection of Lyn Topinka. Penny Postcard, ca.1920, "Shepperd's Dell, Columbia River Highway, Oregon". Caption on back reads: "Shepperd's Dell is one of the most picturesque spots along the highway. Eleven acres at this point was given to Portland by George Shepperd for a public park. This is a very interesting piece of construction, the 24 foot road having been cut out of solid rock. 'On Union Pacific System'." Published by Chas. S. Lipscheutz Company, Portland, Oregon, Card #324. Image copyright Weister Co. In the private collection of Lyn Topinka. Penny Postcard, ca.1920, "Looking West from Shepperd's Dell Dome, Columbia River Highway, Oregon". Card #820. In the private collection of Lyn Topinka. Penny Postcard, ca.1910, "Latourell Falls. A Sheer Drop of 225 feet. Visible from Columbia River Highway, Oregon.". Caption on back reads: "Beautiful Latourell Falls on Columbia River Highway has a sheer drop of 225 feet. Published by Angelus Commercial Studio, Portland, Oregon. Card #16. In the private collection of Lyn Topinka. Penny Postcard, ca.1910, "Columbia River Highway east of Latourelle, near Portland, Ore.". Published by The Oregon News Company, Portland, Oregon. Card is postmarked August 28, 1916. Card #8001. In the private collection of Lyn Topinka. Penny Postcard, ca.1920, "Latourelle Bridge Looking Toward Crown Point, Columbia River Highway, Oregon.". Published by Chas. S. Lipschuetz Company, Portland, Oregon. Card #303. In the private collection of Lyn Topinka. Penny Postcard, ca.1920, "Foot Bridge Over Highway Near Latourelle Falls.". Caption on back reads: "Artistic Foot Bridge. Over the Columbia River Highway neaar Latourelle Falls connecting the two parts of a country estate through which the right of way of the Highway runs. Care has been taken in this, as in all other matters connected with the highway, to preserve artistic walues.". Image copyright Weister Co. Published by Chas. S. Lipschuetz Company, Portland, Oregon. Card #358. In the private collection of Lyn Topinka. Penny Postcard, ca.1916, "Crown Point from The Chalet, Columbia Highway, Ore." Back of card if blank. Card #690. In the private collection of Lyn Topinka. Penny Postcard, ca.1920, "Vista House, Alt. 833 ft., Crown Point Columbia River Highway, Ore." Image copyright Cross & Dimmitt. Card #399. In the private collection of Lyn Topinka. Penny Postcard, ca.1920, "Vista House - Crown Point 'On the Columbia River Highway'." Building on the right is the "Crown Point Chalet", which was built in 1915 and closed in 1927. The building was demolished in the 1950s. Between Vista House and the Crown Point Chalet is "Gardiner's Cafe". Gardiner’s Cafe opened in 1922 as Johnson’s Confectionary. In later years it was known as Vista Cafe. It was torn down by the Forest Service in 1963. Photo by A.M. Prentiss. Published by The Rose City News Co., Portland, Oregon. Card #7. In the private collection of Lyn Topinka. Penny Postcard, Postmarked 1939, "Vista House, Crown Point, Columbia River, Oregon". Published by Wesley Andrews Co., Portland, Oregon. Card #833. Card is postmarked October 30, 1939. In the private collection of Lyn Topinka. Penny Postcard, ca.1940s, "The Vista House and Columbia River Gorge". Published by Anderson Sundry Co., Portland, Oregon. In the private collection of Lyn Topinka. Penny Postcard, ca.1950s, "The Vista House and Columbia River Gorge". Color by Carl Harbert. Distributed only by Smith-Western, Inc., Tacoma-Portland. Card #1752. In the private collection of Lyn Topinka. Penny Postcard, May 5, 1918, "Vista House, Columbia River Highway, Oregon." The dedication of Vista House was on May 5, 1918. Portland's Royal Rosarians can be seen dressed in white. Published by The Oregon News, Portland, Oregon. Card #17. In the private collection of Lyn Topinka. Penny Postcard, Copyright 1918, "Vista House, Columbia River Highway, Ore." Image copyright 1918 by Angelus Studio, #13751. Published by The Oregon News Co., Portland, Oregon. Card #45. In the private collection of Lyn Topinka. Penny Postcard, ca.1920, "Crown Point and Vista House, Columbia River Highway, Oregon." Published by The Oregon News Co., Portland, Oregon. Card #13761. In the private collection of Lyn Topinka. Penny Postcard, ca.1927, "Vista House at Crown Point, Columbia River Highway." Wesley Andrews #759. Postcard appears re-printed, caption on back reads "Vista House at Crown Point, 1927". In the private collection of Lyn Topinka. Click image to enlarge Vista House, Crown Point, Oregon, ca.1943. Penny Postcard, ca.1920, "Columbia Gorge looking East from Crown Point, Columbia River Highway, Oregon." Caption on back reads: "Columbia Gorge from Crown Point showing Cape Horn and Castle Rock in the distance. This view shows the concrete supports on the brink of Thor's Heights, and is one of the most prominent view-points along the Columbia River." Image copyright Weister Co. Published by Chas. A. Lipscheutz Co., Portland, Oregon. American Art Postcard. Card #325. In the private collection of Lyn Topinka. Penny Postcard, ca.1916. On back is printed "Menu Chanticleer Inn", including "Regular Chicken Dinner" for $1.50. In the private collection of Lyn Topinka. Penny Postcard, Image ca.1896, Card ca.1905, "Rooster Rock, Columbia River, Oregon." Oregon Historical Society original image is titled "Hattie Belle at Rooster Rock, by Benjamin Gifford, ca.1896." Published by B.B. Rich, Official Stationer. Card is in the same style as offical cards from the 1905 Lewis and Clark Centennial (see below). In the private collection of Lyn Topinka. Penny Postcard, ca.1905, "Rooster Rock, Columbia River, Oregon." Note fishwheel along side of Cannery. Published by B.B. Rich, Official Stationer. Undivided Back. In the private collection of Lyn Topinka. Penny Postcard, ca.1920, "Columbia River Gorge, Columbia River Highway 25 miles east of Portland. Seen from Union Pacific System Trains." View of Rooster Rock and Crown Point, Oregon, with the Rooster Rock Cannery. Union Pacific System Pictorial Post Card, "The Scenic Columbia River Route to the Pacific Northwest". In the private collection of Lyn Topinka. Penny Postcard, ca.1908, "Rooster Rock, Columbia River, seen from O.R. & N. train." Published for the J.K. Gill Co., Portland, Ore., by M. R., Los Angeles. Card #4020. Postcard has postmark of 1908. In the private collection of Lyn Topinka. Click image to enlarge Rooster Rock and Train Tracks, Postmarked 1914. Penny Postcard, ca.1920, "Sandy River Bridge at Auto Club Grounds - Beginning of the Columbia River Highway, Oregon". View shows the Sandy River, Oregon, and the 6th Street Bridge. The Columbia River Highway was built between 1913 and 1922, at the beginning of the automobile age. In the private collection of Lyn Topinka. Penny Postcard, ca.1920, "The Bluffs Near Troutdale Bridge, Showing Sandy River to the Right, Columbia River Highway, Oregon.". Published by Americhrome, Portland, Oregon. In the private collection of Lyn Topinka. Penny Postcard, ca.1940, "Portland-Columbia Airport, Portland, Oregon." View looking east with Mount Hood and McGuire Island on the left. Published by Angelus Commercial Studio, Portland, Oregon. Card #25. In the private collection of Lyn Topinka. Penny Postcard, ca.1905, "A Bit of the Columbia River, Oregon.". Later postcards (ca.1910) use same image and refer to it as the Columbia River Slough. Published by Frank S. Thayer, Denver, Colorado. Card #700. In the private collection of Lyn Topinka. Penny Postcard, Postmarked 1907, "Evening on Coumbia River Slough". Published by The Portland Post Card Co., Portland, Oregon. Made in Germany. Card is postmarked July 19, 1907. In the private collection of Lyn Topinka. Penny Postcard, ca.1920s, "Jantzen Beach, "On the Columbia River and Pacific Highway".". Card is blank on reverse side. Card #23. In the private collection of Lyn Topinka. Click image to enlarge Penny Postcard: "Swimming Pools at Jantzen Beach on the Columbia River, near Portland, Oregon", postmarked 1929. Photo by A.M. Prentiss. No.451-29. In the private collection of Lyn Topinka. Penny Postcard, ca.1930, "U.S.S. Portland Passing Under St. John's Bridge, Portland, Oregon.". The caption on the back reads: "The St. John's Bridge was completed in June, 1931, at a cost of $4,250,000 and its span of 205 feet above the Willamette River is sufficient to allow any type of vessel to pass under it. The Bridge is 3,833 feet in length. Image Copyright Angelus. Published by Angelus Commercial Studio, Portland, Oregon. Card #27. In the private collection of Lyn Topinka. Click image to enlarge Penny Postcard: The Willamette Falls, Oregon, ca.1910. Penny Postcard, ca.1910, "Willamette Falls, Oregon.". Published by The Portland Post Card Co., Portland, Oregon. Made in Germany. In the private collection of Lyn Topinka. Click image to enlarge Penny Postcard: Fishing, Willamette Falls, Oregon, ca.1910. Penny Postcard, ca.1910, "Fishing at Oregon City, Ore.". Card #7997. In the private collection of Lyn Topinka. Click image to enlarge Penny Postcard: Willamette Falls, Oregon City, Oregon, ca.1920. Penny Postcard, ca.1920, "Willamette Gorge, Oregon City, Oregon.". Published by Britton & Rey, San Francisco, California. Litho. Card #5016. In the private collection of Lyn Topinka. Click image to enlarge Penny Postcard: The Willamette Falls, Oregon, ca.1930. Penny Postcard, ca.1930, "Willamette Falls, Oregon City, Oregon.". Published by Wesley Andrews Company, Portland, Oregon. Card #736. In the private collection of Lyn Topinka. Click image to enlarge Penny Postcard: Oregon City, Oregon, with Willamette Falls, ca.1908. Penny Postcard, Postmarked 1908, "Woolen Mill, Electric Pulp and Paper Mill, Flour Mill and Filter Plant on the Willametter River, Oregon.". Published by M. Rieder, Los Angeles, California, for Howell & Jones, Oregon City, Oregon. Made in Germany. Card #2753. Card is postmarked January 2, 1908. In the private collection of Lyn Topinka. Penny Postcard, ca.1905, "City of Portland & Mt. Hood." Published by B.B. Rich, Official Stationer. Card is in the same style as offical cards from the 1905 Lewis and Clark Centennial (see below). In the private collection of Lyn Topinka. Penny Postcard, Copyright 1899 by H.A. Hale, "River Front, Portland, Oregon." Card #5914. Card is postmarked October 19, 1904. Undivided back. In the private collection of Lyn Topinka. Penny Postcard, ca.1910, "U.S. War Vessels in Harbor, Portland, Ore.". Published by M. Rieder, Los Angeles, California. Card #3945. In the private collection of Lyn Topinka. Penny Postcard, ca.1920, "Shipping Scene, Portland, Oreg.". Caption on the front top reads: "Grain, Lumber, Flour, Fruit, etc., to All Parts of the World.". Published by Chas. S. Lipschuetz Company, Portland, Oregon. Card #274. In the private collection of Lyn Topinka. Penny Postcard, ca.1930, "View from a Skyliner over Willamette River, Looking North Toward Mt. St. Helens, Wash." Image copyright Brubaker Aerial Surveys, Portland, Ore. Published by Wesley Andrews Co., Portland, Oregon. Card #749. In the private collection of Lyn Topinka. Penny Postcard, ca.1940, "Mt. Hood, from Portland, Oregon". Caption on back reads: "Portland, Oreogn. 'The Rose City'. Mt. Hood (Altitude 11,225) in background. Population 500,000." Published by Angelus Commercial Studio, Portland, Oregon. Card #3. In the private collection of Lyn Topinka. Penny Postcard, ca.1945, "$1,000,000 Public Market on Portland Harbor, Showing Patrol Boat and Seaplanes, Portland Oregon." Caption on back reads: "One Million Dollar Public Market, Portland, Oregon". Published by Angelus Commercial Studio, Portland, Oregon. Card #31. In the private collection of Lyn Topinka. Click image to enlarge Penny Postcard: "The CENTENNIAL QUEEN", 1959. Penny Postcard postmarked 1959. Caption on back reads: "The "CENTENNIAL QUEEN", river excursion boat which plies the Willamette from Portland to its mouth and up the Columbia, passing through the Burnside Bridge in mid-Portland." Color Photo by Georg Nilsen. Published by Western Color Sales Inc., #K-1860. In the private collection of Lyn Topinka. Penny Postcard, Postmarked 1916, "Beautiful Homes and Side Walks Lined with Roses, Portland, Oregon.". Published by Lipschuetz Company, Portland, Oregon. Card #289. April 4, 1916, date is handwritten on back. In the private collection of Lyn Topinka. Penny Postcard, Postmarked 1909, "Forestry Building, Rose Carnival, Oregon.". The Foresty Building was built for the 1905 Lewis and Clark Centennial and left as a memorial to the explorers. Published by E.P. Charlton & Co., Portland, Oregon. In the private collection of Lyn Topinka. Penny Postcard, Copyright 1903, "Lewis & Clark Centennial, Portland, Oregon, 1905. Copyright 1903 by Lewis-Clark Exposition Co. Published by H. Mitchell, San Francisco. Undivided back. Card has scotch-tape residue on top. The red horizontal mark on bottom of image is covering words "Lewis & Clark Exposition". The printing "The Lewis & Clark Centennial" is printed on top of the red mark. In the private collection of Lyn Topinka. Penny Postcard, Double Card, 1905, "Birds Eye View of Lewis and Clark Centennial Exposition.". In the private collection of Lyn Topinka. Penny Postcard, 1905, "General View", Lewis and Clark Exposition, Portland, Oregon. "Official Mailing Card Lewis & Clark Centennial, 1905, Portland, Oregon". Published by B.B. Rich, Official Stationer. In the private collection of Lyn Topinka. Penny Postcard, 1905, Lake View Terrace, Lewis and Clark Exposition, Portland, Oregon. "Official Mailing Card Lewis & Clark Centennial, 1905, Portland, Oregon". Published by B.B. Rich, Official Stationer. View shows Guild Lake on the right. In the private collection of Lyn Topinka. Penny Postcard, 1905, U.S. Government Building, Lewis and Clark Exposition, Portland, Oregon. "Official Mailing Card Lewis & Clark Centennial, 1905, Portland, Oregon". Published by B.B. Rich, Official Stationer. View is looking north past Guild Lake and the Willamette River, towards Mount St. Helens (left) and Mount Adams (right), Washington. In the private collection of Lyn Topinka. Penny Postcard, 1905, Agricultural Palace, Lewis and Clark Exposition, Portland, Oregon. Published by B.B. Rich, Official Stationer. In the private collection of Lyn Topinka. Click image to enlarge Lewis and Clark Exposition, Portland, Oregon, Industrial and Liberal Arts Palace, 1905. Published by E.P. Charlton & Co., Portland, Oregon. In the private collection of Lyn Topinka. Click image to enlarge Lewis and Clark Exposition, Portland, Oregon, Manufacturers Liberal Arts and Varied Industrial Building, 1905. Caption on top reads: "Official Mailing Card Lewis & Clark Centennial, 1905, Portland, Oregon". Published by B.B. Rich, Official Stationer. In the private collection of Lyn Topinka. Click image to enlarge Lewis and Clark Exposition, Portland, Oregon, Government Building and the Bridge of All Nations, 1905. Penny Postcard, 1905, "Government Building and Bridge of All Nations. Lewis & Clark Exposition.". Published by the J.K. Gill Co., Portland, Oregon. Card #1644. In the private collection of Lyn Topinka. Click image to enlarge Lewis and Clark Exposition, Portland, Oregon, The Trail, 1905. Penny Postcard, 1905, "The Trail. Lewis and Clark Expo." Published by the J.K. Gill Co., Portland, Oregon. Card #1645. In the private collection of Lyn Topinka. Click image to enlarge Lewis and Clark Exposition, Portland, Oregon, Centennial Park and Experiemntal Gardens, 1905. Click image to enlarge National Cash Register Building, Lewis and Clark Exposition, Portland, Oregon, 1905. Penny Postcard, 1905, "Lewis & Clark Exposition, Portland, Oregon." Front of building says "A Trip to the N.C.R., Motion Pictures, Free". The National Cash Register Building is one of a handful of structures from the 1905 Lewis & Clark Exposition to still be around today. This building is now St. Johns Theatre and Pub, located in St. Johns, Oregon. Undivided back. In the private collection of Lyn Topinka. Penny Postcard, Postmarked 1907, "Columbia River, Vancouver, Washington.". Published by M. Reider, Los Angeles. Made in Germany. Card is postmarked July 23, 1907. In the private collection of Lyn Topinka. Penny Postcard, Postmarked 1908, "Lumber Schooner Loading, Vancouver, Wash.". Published by Portland Post Card Co., Portland, Ore. Card #1016. Card is postmarked September 11, 1908. In the private collection of Lyn Topinka. Penny Postcard, ca.1910, "Water Front, Columbia River, Vancouver, Wash.". Published by Portland Post Card Co., Portland, Ore. Card #1009. In the private collection of Lyn Topinka. Penny Postcard, ca.1920, "Bird's-eye View of Part of Business Section of Vancouver, Wash., also Showing Pacific Interstate Bridge between Portland and Vancouver.". Published by The Oregon News Co., Portland, Oregon. Card #V-3. In the private collection of Lyn Topinka. Penny Postcard, Postmarked 1936, "Vancouver Washington and Columbia River looking Northwest". Caption on bottom reads: "On Pacific Highway". Divided back, card is postmarked September 28, 1936. Copyright Brubaker Aerial Surveys. Card #549. In the private collection of Lyn Topinka. Penny Postcard, Postmarked 1909, "Mount Hood from Vancouver Barracks, Vancouver, Wash.". Published by Portland Post Card Company, Portland, Oregon. Card #1010. Divided back, card is postmarked July 1, 1909. This area was known as "Jolie Prairie", today the location of Fort Vancouver, Vancouver Barracks, Pearson Airfield, and Vancouver industry and condominiums. In the private collection of Lyn Topinka. Penny Postcard, ca.1920, "The Vancouver Barracks, Vancovuer, Washington.". Published by Wesley Andrews Co., Portland, Oregon. Card #552. In the private collection of Lyn Topinka. Penny Postcard, Postmarked 1918, "General Headquarters, Department of the Columbia, Vancouver, Wash. On the North Bank Road.". Published by Portland Post Card Co., Portland, Oregon. Card #P1415. In the private collection of Lyn Topinka. Click image to enlarge Interstate 5 Bridge over the Columbia River, ca.1920. Penny Postcard, ca.1920, "Interstate Highway Bridge over Columbia River, Between Portland, Oregon, and Vancouver, Washington.". Published by Wesley Andrews, Co., Portland, Oregon. Card #543. In the private collection of Lyn Topinka. Click image to enlarge Interstate 5 Bridge with cars, ca.1920. Penny Postcard, ca.1920, "'Pacific Highway Interstate Bridge', Spanning Columbia River, Portland, Ore., to Vancouver, Wash.". Caption on back reads: "New Interstate Bridge. This new Interstate Bridge, spanning the Columbia River, connecting Portland, Oregon and Vancouver, Washington, is now being constructed. The very latest type of bridges, which is the greatest of bridge engineering at this time, is one of the interesting features of the New Pacific Highway.". Published by Lipschuetz & Katz, Portland, Oregon. Card #194. In the private collection of Lyn Topinka. Penny Postcard, ca.1920, "Interstate Bridge between Vancouver, Wash. and Portland, Ore.". Caption on back reads: "Interstate Bridge, between Vancouver, Wash., and Portland, Ore. -- This bridge was erected during 1917 at a cost of $1,500,000. Previous to the erection of same, the traffic was taken care of by the ferry shown in the picture.". Published by The Oregon News Co., Portland, Oregon. Card #8241. In the private collection of Lyn Topinka. Penny Postcard, ca.1910, "New Ferry 'City of Vancouver' between Portland, Oregon and Vancouver, Wash.". Published by Sprouse & Son, Tacoma, Wash. Made in Germany. In the private collection of Lyn Topinka. Penny Postcard, ca.1910, "Vancouver Ferry entering Vancouver, Wash., North Bank Bridge in Distance. On the North Bank Road." Published by Portland Postcard Co., Portland, Oregon. Made in Portland. Card #P1416. In the private collection of Lyn Topinka. Penny Postcard, ca.1910, "Ferry Boat 'City of Vancouver' making connection between Vancovuer, Wash., and Portland, Ore.". Plate 2110. In the private collection of Lyn Topinka. Penny Postcard, Postmarked 1910, "Crossing the Columbia by Moonlight, Portland, Oreg. and Vancouver, Wash. Ferry.". Published by Portland Post Card Co., Portland, Oregon. Card #1008. In the private collection of Lyn Topinka. Click image to enlarge Vancouver to Portland SP&S Railway Bridge, ca.1911. Penny Postcard, Postmarked 1911, "North Bank Railway Bridge, (two miles long), crossing the Columbia River from Vancouver, W'n. to Portland, Ore.". Published by Portland Post Card Co., Portland, Oregon. In the private collection of Lyn Topinka. Click image to enlarge Vancouver to Portland SP&S Railway Bridge, ca.1920. Penny Postcard, ca.1920, "Spokane, Portland & Seattle Railway, Columbia River Bridge.". Published by Pacific Novelty Co., San Francisco, California. Card #O-144. In the private collection of Lyn Topinka. Click image to enlarge Penny Postcard: "The Old Apple Tree, Planted 1826, Vancouver, Wash., On Pacific Highway", ca.1914-1920. Penny Postcard ca.1914-1920, Published by Wesley Andrews, Inc., Portland, Oregon, No.542. In the private collection of Lyn Topinka. Click image to enlarge Penny Postcard: The Old Apple Tree, Vancouver, Washington, 1940. Penny Postcard 1940. Caption on back: "No.35 in Union Oil Company's Natural Color Scenes of the West. Father of the great Northwest apple industry is this oldest apple tree. Grown from seed brought from England in 1826, the tree is still bearing. It may be seen at Vancouver army barracks, Vancouver, which originally was a Hudson Bay Post." Copyright 1940, Union Oil Co. of California. Made in U.S.A. In the private collection of Lyn Topinka. Click image to enlarge Whispering Giant scupture, Vancouver, Washington. Penny Postcard ca.1980s. Caption on back: "Toth's Nationwide Indian Sculptures (with a cause). Sculptor Peter Toth's gift, one monument in each of the 50 states, to raise the Nation's conscience to the plight of the American Indian. Created from a 42,000 lb. fir; 25 ft. high; 8 ft. across. Appeared in "Ripley's Believe It or Not." Located in Esther Short Park in Vancouver, Washington." Photo by Greg Johnson. In the private collection of Lyn Topinka. Click image to enlarge Lighthouse at the junction of the Willamette River with the Columbia River, ca.1910. Penny Postcard, ca.1910, "Light House at the Junction of Columbia and Willamette Rivers.". Published by Portland Post Card Co., Portland, Oregon. In the private collection of Lyn Topinka. Click image to enlarge Penny Postcard: "The Geo. W. Elder in drydock, Portland, Oregon", ca.1905. Penny Postcard ca.1905. Edward H. Mitchell Publisher, San Francisco, #1021. Printed in the United States. In the private collection of Lyn Topinka. Click image to enlarge Northern Pacific Rainroad Train crossing the Columbia on the Ferry "Tacoma", ca.1908. Penny Postcard, Postmarked 1908, "Northern Pacific Railroad Train crossing the Columbia River on Ferry.". Published by Portland Post Card Company, Portland, Oregon (Made in Germany). Card #7009. Card is postmarked July 16, 1908. In the private collection of Lyn Topinka. Click image to enlarge Cowlitz River and Kelso, Washington, ca.1905. Penny Postcard, ca.1905, "Tow Boat, Cowlitz River, Kelso, Wash.". Published by E.C. Kropp, Milwaukee, Wisconsin, made for Dunham and Abbott. Undivided back. In the private collection of Lyn Topinka. Click image to enlarge Cowlitz River and the Long Bell Lumber Mills, Longview, Washington, ca.1930. Penny Postcard, ca.1930, "Long Bell Lumber Mills, Mt. St. Helens in Distance, Longview, Wash.". Image copyright Brubaker Aerial Surveys. Published by Wesley Andrews, Inc., Baker, Oregon. Card #518. In the private collection of Lyn Topinka. Click image to enlarge Long Bell Lumber Mills, Longview, Washington, ca.1930. Penny Postcard, ca.1930, "Long Bell Lumber Mills, Longview, Wash.". Published by Wesley Andrews, Inc., Baker, Oregon. Card #515. In the private collection of Lyn Topinka. Penny Postcard, Postmarked 1930, "On Columbia River and Pacific Highways, Columbia River - Longview Bridge, Longview, Wash.". View from Oregon side. Mount St. Helens, Washington, is in the background. Published by Wesley Andrews, Inc., Baker, Oregon. Card #525. In the private collection of Lyn Topinka. Penny Postcard, Postmarked 1930, "Columbia River Longview Bridge, Longview, Wash., On Columbia River and Pacific Highway.". Published by Wesley Andrews, Inc., Baker, Oregon. Card #631. Card is postmarked August 25, 1930. In the private collection of Lyn Topinka. Penny Postcard, ca.1930s to 1940s, "Longview, Washington, Rainier, Oregon, Highway Bridge.". Photo by A.M. Prentiss. Caption on back reads: "Longview-Rainier Bridge, connecting Longview, Washington on the Pacific Highway with Rainier, Oregon, on the lower Columbia River Highway, 50 miles from Portland, Oregon. Published by The Rose City News Co., Portland, Oregon. Card #31. In the private collection of Lyn Topinka. Penny Postcard, ca.1930s to 1940s, "On the Old Oregon Trail, Columbia River Longview Bridge, Longview, Washington to Rainier, Oregon.". Caption on back reads: "Main Span, 1,200 feet, Clear Height 195 feet, River Structure, 3,800 feet, Approaches 4,400 feet.". Published by Wesley Andrews, Inc., Baker, Oregon. Card #535. In the private collection of Lyn Topinka. Penny Postcard, "SANDY RIVER, Oregon". Caption on back reads: "Dip netters catching their limit of smelt, during the annual run, as the fish fight their way to their spawning grounds. This scene taken not far from Portland." Color by C.H. Ebeling. Published by Western Color Sales Inc., Portland, Oregon, #K1806. In the private collection of Lyn Topinka. Click image to enlarge Main Street looking west, Rainier, Oregon, ca.1911. Penny Postcard, Postmarked 1911, "Main Street looking West, Rainier, Ore.". Published by C. Kropf, Milwaukee. Card #1538. Card is postmarked January 25, 1911. In the private collection of Lyn Topinka. Click image to enlarge Rainier, Oregon, and Mill, ca.1916. Penny Postcard, Postmarked 1916, "One of the Big Mills, Rainier, Ore..". Card is postmarked March 21, 1916. In the private collection of Lyn Topinka. Penny Postcard, ca.1915, "Log Chute, on Columbia River". Published by the Pacific Novelty Co., San Francisco, California. Card #O.41. In the private collection of Lyn Topinka. Known as "The Incline", this railway was built by John B. Yeon in order to lower train car loads of logs from the rim above Rainier, Oregon, down to the slough below. The "Incline" was part of the Yeon and Pelton Company which operated at the beginning of the 1900s, and located three miles from Rainier. Penny Postcard, ca.1910, "Pilot Rock, Lower Columbia River". Published by the Portland Post Card Co, between 1907 and 1915. In the private collection of Lyn Topinka. Penny Postcard, ca.1940s-1950s, "Hungry Harbor.". Caption on back reads: "Old fish-net drying docks near Knappton, Washington at the mouth of the mighty Columbia River." Color by John F. McNamara. Published by Columbia View Cards, Ocean Park, Washington. In the private collection of Lyn Topinka. Click image to enlarge Penny Postcard: "Two Millon Cans of Columbia River Salmon", McGowans' Cannery, McGowan, Washington, postmarked 1908. Printing on box in image reads: "McGowans' Spring Pack, 1lb. flat, Columbia River Salmon. Published for Olds, Wortman and King, Portland, Oregon. Printed in Germany. In the private collection of Lyn Topinka. Penny Postcard, "Svensen, Ore., Coe Photo, U.F.B. Picnic 1912". Divided back. In the private collection of Lyn Topinka. Penny Postcard, Copyright 1899, "Sturgeon Fishing on the Columbia River, Oregon.". Published by Detroit Photographic Company. Card #5223. Undivided back. In the private collection of Lyn Topinka. Penny Postcard, Postmarked 1907, "Columbia River Fishing Fleet.". These small gillnet fishing boats were powered by two triangular sails, giving rise to the name "Butterfly Fleet". Published by Edward H. Mitchell, San Francisco, California. Card #511. In the private collection of Lyn Topinka. Penny Postcard, Copyright 1899, "Sturgeon on the Columbia River, Oregon.". Published by Detroit Photographic Company. Card #5222. Undivided back. In the private collection of Lyn Topinka. Penny Postcard, Postmarked 1910, "Columbia Riveer Sturgeon, Weight 928 lbs.". Published by Portland Post Card Co., Portland, Ore., and Seattle, Wash. Printed in Germany. Card #7259. Card is postmarked June 10, 1910. In the private collection of Lyn Topinka. Penny Postcard, ca.1910, "Sturgeon caught in the Columbia River.". Published by Portland Post Card Co., Portland, Oregon. Card #P1054. In the private collection of Lyn Topinka. Penny Postcard, ca.1910, "Seining on the Columbia River.". Published by Sprouse & Sons, Tacoma, Wash. Printed in Germany. Card #1074. In the private collection of Lyn Topinka. Penny Postcard, Postmarked 1910, "Salmon Fishing on the Columbia". Published by Detroit Publishing Company. Card #7890. Card is postmarked September 7, 1910. In the private collection of Lyn Topinka. Penny Postcard, Postmarked 1910, "Seining for Salmon, Columbia River, Oregon". Published by Mitchell. Card is postmarked September 14, 1910. Card #2287. In the private collection of Lyn Topinka. 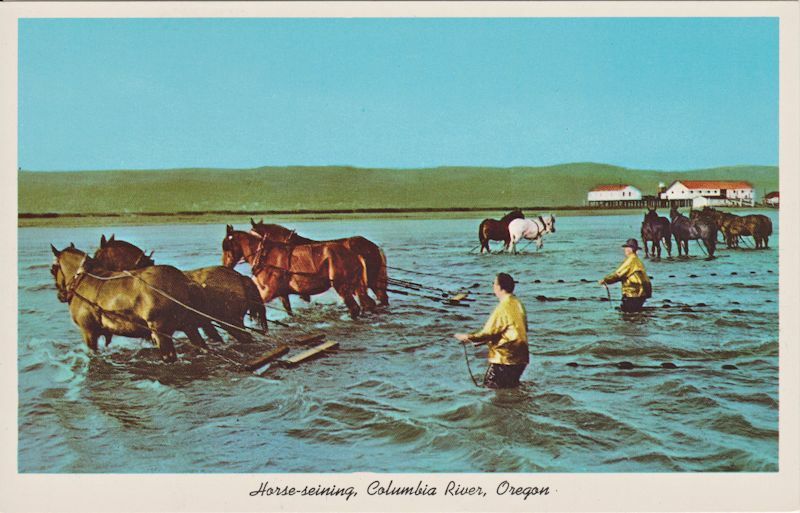 Penny Postcard, "Horse-seining, Columbia River, Oregon.". 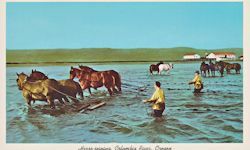 Caption on back reads: "Early day horse-seining for salmon. One end of the fish net was anchored on the sand bar. A skiff towed the net in an arc into the fish in the river, bringing the end back to the horses which pulled the full net of fish on to the sand bar to be harvested. This practice is discontinued." Anderson Scenic Post Cards, Portland, Oregon. Chrome card. In the private collection of Lyn Topinka. Penny Postcard, ca.1930, "Purse Seining in the Scenic Pacific Northwest.". Washington State Progress Commission Photo, Published by E.C. Knopp Co., Milwaukee, Wis. Card #P108. Linen. In the private collection of Lyn Topinka. Penny Postcard, Postmarked 1917, "Waterfront of Astoria, Oregon, showing some of the Salmon Canneries.". Published by Louis Scheiner, Portland, Oregon. Card is postmarked June 12, 1917. In the private collection of Lyn Topinka. Penny Postcard, ca.1910, "The Train runs for several miles over trestle bridges as it approaches Astoria, Oregon." Published by Pacific Novelty Co. of San Francisco, California. In the private collection of Lyn Topinka. Penny Postcard, ca.1920, "Salmon Cannery, Columbia River, Astoria, Oregon." Published by Wesley Andrews Co., Baker, Oregon. Card #505. In the private collection of Lyn Topinka. Postcard, Postmarked 1909, "Fishermen's Homes, Astoria, Ore." Published by M.R.L.A., #9265. Made in Germany. In the private collection of Lyn Topinka. Penny Postcard, ca.1910, "Columbia River Salmon waiting for Shipment." Published by M. Rieder, Los Angeles, California. Card #3950. In the private collection of Lyn Topinka. Penny Postcard, ca.1930, "Interior Salmon Cannery, Daily Capacity 60 Tons, Columbia River." Published by Wesley Andrews Co., Baker, Oregon. Card #799. In the private collection of Lyn Topinka. Penny Postcard, ca.1910, "Hammond Lumber Mills, showins millions of feet of floating lumber, Astoria, Oregon." Published by Pacific Novelty Co., San Francisco, California. Card #3313. In the private collection of Lyn Topinka. Penny Postcard, ca.1960s, "Fort Astoria, Astoria, Oregon". Caption on back reads: "This famous fort was restored in 1956. A "must" for the visitor to this area. Image by Henry Lonberg. Distributed and Published by Smith's Scenic Views, Tacoma, Washington. In the private collection of Lyn Topinka. Penny Postcard, Postmarked 1912, "Fort Astor, Astoria Centennial, Astoria, Oregon.". Published by Edward H. Mitchell, San Francisco, Cal., for O.W. Whitman, Astoria, Oregon. Card #1641. Card is postmarked November 11, 1912. In the private collection of Lyn Topinka. Penny Postcard, ca.1940s-1950s, "Megler, Wash. Ferry Landing.". Photographed by Boyer. Caption for this image found on the National Park Service Website reads: "The ferry landing at Megler, ca.1927-1856." In the private collection of Lyn Topinka. Penny Postcard, ca.1910, "Fisherman's Bay on the Columbia River". PNC Series. Made in Germany, Card #3818. Caption for this image found on the National Park Service Website reads: "Photograph of Megler Cove taken from Point Ellice ca.1907-1927. Note the fish receiving station and the cutting and filling associated with construction of the railroad. The Megler railroad terminal is to the right of the photo in the background. The view is to the northeast." In the private collection of Lyn Topinka. Click image to enlarge Penny Postcard: Desdemona Sands Lighthouse, Columbia River, Astoria, Oregon, ca.1905. Penny Postcard: Coe photo, undivided back, ca.1905. In the private collection of Lyn Topinka. Penny Postcard, ca.1910, "Quarters, Fort Columbia, Wash.". Divided back. In the private collection of Lyn Topinka. Penny Postcard, 1906, "Fort Stevens, Ore., Copyright 1906 by Frank Woodficla". Card is postmarked August 21, 1912. Divided back. In the private collection of Lyn Topinka. Penny Postcard, Postmarked 1907, "Fort Stevens, Oregon". Card is postmarked January 23, 1907. Undivided back. In the private collection of Lyn Topinka. Click image to enlarge Penny Postcard: Peter Iredale wreck, Clatsop Spit, Oregon, 1906. Penny Postcard, 1906, "Peter Iredale Wreck, 1906". In the private collection of Lyn Topinka. Penny Postcard, Postmarked 1908, "Fort Canby Light House, Ore." Note the cannons of Fort Canby. Card #12, O.W. Whitman, Astoria, Oregon, "hand-colored". In the private collection of Lyn Topinka. Penny Postcard, Postmarked 1912, "Fort Canby Lighthouse, Mouth of Columbia River, near Seaside, Oregon." Note the cannons of Fort Canby. Published by Pacific Novelty Co., San Francisco. Card #5222. Card is postmarked September 5, 1912. In the private collection of Lyn Topinka. Penny Postcard, ca.1910, "North Head Light House, at entrance to Columbia River.". Published by Portland Post Card Company, Portland, Oregon. Card #1028. In the private collection of Lyn Topinka. Penny Postcard, ca.1920s, "View from Beards Hollow, Near Sea View, Wash.". Published by Wesley Andrews, Baker, Oregon. Card #625, In the private collection of Lyn Topinka. Penny Postcard, ca.1930, "Dead Man's Hollow from Ocean Beach Highway, Long Beach, Wash.". Photo by Wesley Andrews, Portland, Oregon. Card #626, In the private collection of Lyn Topinka. Penny Postcard, Postmarked 1908, "Black Lake near Long Beach, Wash.". Published by M. Rieder, Los Angeles, California. Card #3959. In the private collection of Lyn Topinka. Penny Postcard, ca.1920, "Airplane view of Long Beach, Wash.". Image by Brubaker Aerial Surveys. Published by Wesley Andrews, Portland, Oregon. In the private collection of Lyn Topinka. Penny Postcard, ca.1930, "Air view showing Saddle Mountain and Seaside, Oregon". Copyright Brubaker Aerial Surveys, Oregon. Published by Wesley Andrews Co., Portland, Oregon. Card #483. In the private collection of Lyn Topinka. Penny Postcard, Postmarked 1950, "Airplane View, Seaside, Oregon." Caption on bottom reads: "Oregon Coast Highway at the End of the Old Oregon Trail." Image copyright Prentiss. Published by Wesley Andrews Company, Portland, Oregon. Card is Postmarked August 3, 1950. Card #489. In the private collection of Lyn Topinka. Penny Postcard, ca.1940, "The Trail's End and Tillamook Head, Seaside, Oregon". Published by Wesley Andrews Col., Portland, Oregon. Card #475. In the private collection of Lyn Topinka.